As S. Colleen recounts in this final blog her and S. Olivia’s trip to Japan, we are blessed to learn how deep is the mutual respect and love that grew up and endured between our American Sisters and the Japanese people with whom they worked and formed lasting bonds. The greatest JOY that Sister Olivia had was viewing the mountains of Hokkaido! Daily she marveled at these views. Muroran is surrounded by/nestled in the mountain range. Daily walks involve going up and down all the hills. Good exercise is had by all - including the two Americans! The Japanese demeanor is part of S. Olivia’s life. She is Japanese in stature: their humble posture of bowing is integral to WHO she is--her persona. Thus she finds it difficult to acknowledge that she is loved by so many and revered in every corner of Japan, but especially on the island of Hokkaido. 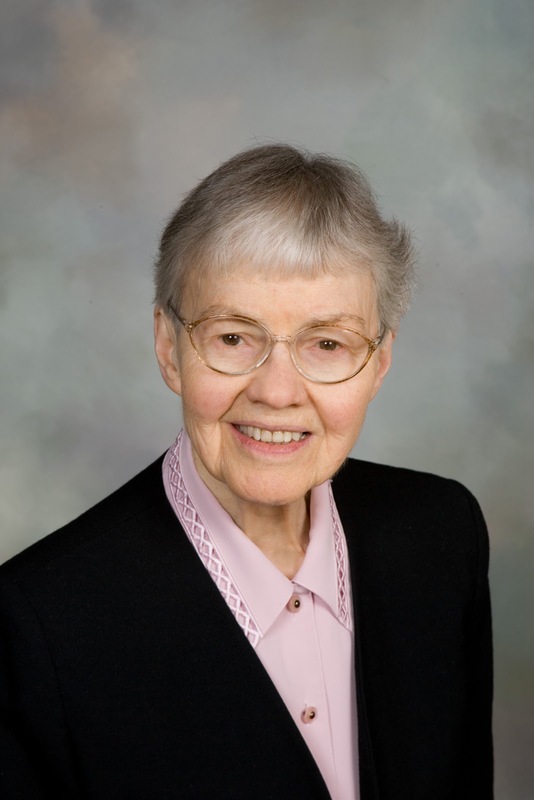 She also maintains connections with the monks of St. John's Abbey, located at Trinity Monastery in Fujimi, Honshu, Japan (north of Tokyo) who connected with her and Sister Jane Weber, while they served in Japan. This being November, the month when we remember especially those who have died, it seems appropriate to close by recognizing our foremothers who have gone before us and who laid the groundwork for the very special relationship our monastery has with the people of Japan: Sisters Francetta Vetter, Regia Zens, Ursuline Venne, Benedice Schulte, Euphrasia Ruhland, Mary Gertrude Maus, and also S. Glenore Riedner (who served in Taiwan). There are others who are still in our midst: Sisters Olivia Forster, Jane Weber, Shaun O’Meara, Hilda Keller, Annette Brophy and former Sisters: Renee Genereux and Mary Feeley and, of course, Sister Renata Mori of the Japan community. For all our Sisters who served in Japan and for the continuing blessings of our relationship with the people of Japan, we are are truly grateful. This is not about roses . . . well, maybe just a little. 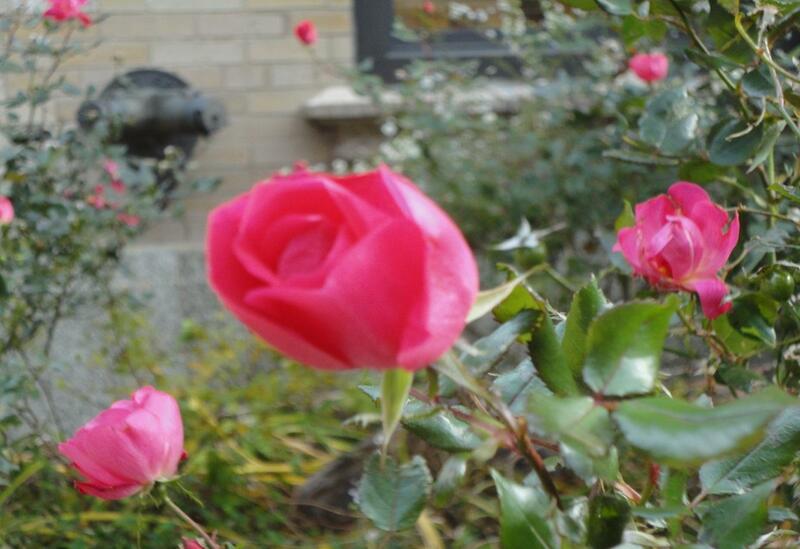 This picture of roses was taken in mid-November in front of our residence at CTU in Chicago. One could believe that roses are not a very hardy flower and need a great deal of pampering but these wild roses demonstrate that they are more resilient than one would believe. In my program at CTU (Catholic International Union) in Chicago there are several international students from countries such as Korea, China, Indonesia, Zambia, and Namibia. The Asian students especially have a challenging time because they are still unfamiliar with the English language, the culture such as food, and customs. From the moment I began classes with them in August I admired their determination to fit in, learn the language and follow our classes in the best way they can. But Sunday evening I experienced something that brought home to me in a very real and poignant way what they can be up against. Since no meals were being served in our cafeteria until Monday morning, several of us went out for supper including our Korean student. When it was time to order he was able to tell the waitress what he wanted but then she asked him, "soup or salad?" He did not understand what she meant. We explained it to him so he told her he would have soup. The next question was, "what kind: French Onion, cream of brocoli or Chicken noodle?" By then he was totally confused. So we explained again. He chose the French Onion not knowing at all what he was ordering. Again the question came: "French fries, mashed or sweet potatoe fries? What about a vegetable: corn, beans or carrots?" As the questions kept coming at him it became very evident to us that despite our help and encouragement he was struggling to keep his composure. It had never occurred to me that for our Korean friend and the other international students that something as simple as eating in a restaurant could be such an ordeal. He and the roses in the picture have something in common, wouldn't you say? The history of the tea ceremony, an essential part of Zen Buddhist thought and practice, is very old. It’s more than a cup of hot water and tea leaves. It has all the earmarks of holy leisure and gracious hospitality. Time and time again, it has been proven to be relaxing, refreshing and, yes, healthy! Actually, I enjoy it as a religious experience by its very nature. Imagine our delight on October 8 as six of us Benedictine Sisters were invited guests at a ceremony performed by a professional, mother of my former student, Yoshie Takada. Beautiful ceramic bowls (cups), flower arrangements and a sweet morsel welcomed us. Seated on chairs (actually, guests usually sit on their ankles on a tatami--straw matting--floor), we watched the calm and reverence marking Mrs. Takada’s graceful movements, her delicate handling of instruments, even to the dipping of the boiling water into each cup, and the almost imperceptible stirring that followed. Her “assistant” reverently placed a “bowl” of steaming green tea before each of us. We bowed mutually before picking up our bowl and began to sip appreciatively. Custom then allows guests to examine the lovely bowl, turning it every which way, and to comment on it. We did exactly that, delighted in so beautiful a vessel. Up to this time, all was done in a circle of quiet calm! But after the last sip of tea, regular chatter resumes and we’re back to our normal selves. It’s been said that the tea ceremony cult is like admiring the beautiful among the more squalid facts of everyday life. It creates a certain harmony and purity, a mystery of mutual charity, and a certain touch of romanticism as we plod along in everyday life. I find it to be all of these! Yesterday I was reminded again of the healing power of human connections. Each November the monastic community has a communal anointing service for those who request healing. Two aspects of this service create an amazing sense of solidarity and sacred space. The Sisters to be anointed sit in the front pew of one small section of the chapel spaces. All the Sisters seated behind those being anointed walk up to each one, place their hands on their bowed heads for several seconds, and invite Healing Love to flow into all levels of their being. Human touch, accompanied by images of the recipient’s luminescent wholeness, invites each Sister to humbly receive the ointment of loving communal solidarity. Many ministers of healing acknowledge that the explicit invitation for “Love to be manifest” always opens the recipient to an outpouring of wholehearted healing. Within this sacred sharing, there is a ripple of healing that extends well beyond those being anointed. After the prayerful laying on of hands, each Sister’s name is called. Then follows a liberal and unhurried anointing of the recipient’s forehead and hands with oil. This powerful proclamation of each Sister’s unique identity, and their open receptivity to the oil-of-compassion, can create spaces for healing movements to gently unfold deep within. It invites each to move into the days ahead with renewed strength. With grateful hearts, those in solidarity with the anointed ones, share in this renewal of communal wholeness. This week, it’s time to share what S. Olivia Forster and S. Colleen Haggerty did during their two weeks in Japan. The following notes were submitted by S. Colleen shortly after returning to the US. It’s clear that their time there was more than just a vacation. The activities planned for the Sisters show how much their Benedictine heritage means to the people of Muroran and how deeply they continue to honor the connection. One of the special gifts during this time in Japan was being with our Sisters at Saint Benedict’s Monastery, Muroran, an independent monastery whose roots spring from Saint Benedict’s Monastery, St. Joseph. Many of our Sisters here in Minnesota know a number of them in Japan (some of whom spent years in formation and study here), so renewing friendships and memories was a GREAT GIFT of these TWO WEEKS. • Afternoon social time with many Japanese courses at the home of Toshiaki Sugawara (head teacher at school) and his wife Mineko; unusual invitation as most Japanese families do not easily invite people into their homes. Mineko is an accomplished musician -- piano and voice; has many parts in operas; she entertained us with many selections. Two of the Japanese sisters accepted the invitation. • Reception-- tea ceremony at the school on Saturday afternoon with alumnae. Many attended. • Reception at the Catholic Church at East Muroran on Sunday after Mass; good Catholic people; tribute to S. Olivia and to American Sisters: speeches, light lunch; choir performed with Mineko Sugawara directing. • On Monday afternoon, tea ceremony at the home of a professional tea ceremony teacher whose daughter had performed at Saturday’s concert. • Gathering of alums-- three former students (and Mitsuo Takada, former principal at Kasei Gakuin) in Tokyo Narita Airport during our four-hour layover there on Tuesday, October 16; had hoped for more to attend but a workday for many. Over 40 alums in the Tokyo area. • Many one-on-one visits to and from friends--personal and school-connected; each one carrying gifts (o-miyage) of flowers, candy and Japanese treats or small gift. Anne Morrow Lindbergh, author of the classic Gift from the Sea, speaks mysterious words about the human experience of loneliness, an uncomfortable situation, at best, and one from which we normally wish to escape! She says, however: “Loneliness is really never cured; it is only covered up, filled temporarily. And I am not so sure we should try so hard to cure it or cover it up. Loneliness, if one comes to terms with it, is one’s good daemon: out of it come one’s creative powers” (in Against Wind and Tide, a collection of her letters and journals, p 140). A broken relationship-- or no relationships at all-- a disability that separates one from ‘normal’ human beings, a death, a writing block, a feeling of having no identity or acceptability, the experience of being on the periphery instead of on the "inside"—these are but a few of those deep feelings or experiences that may cause unbearable loneliness. Because of our inability to deal with this loneliness, we often seek to fill up the void, cover up the pain, or, in some way, escape that which is really inescapable. Quite unexpectedly, our author says we need loneliness and ought to protect each other’s precious loneliness! Her Gift from the Sea was born during the lonely hours of her retreat at the seashore. What creative action or expression might arise from us, if we could but hunker down and be lonely? How could our country be different if we stopped filling up the airwaves and newsprint with words that simply cover up the deep loneliness which we currently suffer and which causes so much estrangement from one another? This week, our Japan blog is a story about kindness: the kindness that enabled S. Olivia Forster and S. Colleen Haggerty to travel there, and the kindness with which they were greeted during their stay. Mr. Tom Haeg decided to gift Sister Olivia with this trip because her experience there and the love he also has for Japan. When Tom graduated from Saint John’s University, he decided he wanted to go to Japan. He came to the high school, where S. Olivia was principal at the time, looking for a job. Sadly, she had to tell him there were no openings in their school. So off he went to law school and practiced law; he also became a judge in Hennepin County, Minn. Years passed. 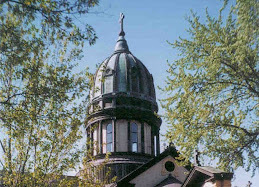 One of Tom’s daughters graduated from the College of Saint Benedict in 2009. At the ceremony he inquired whether S. Olivia was around. She was. Thus-- friends once again! Tom had continued to have a special interest in Japan; when he retired, he “took up” that interest in earnest. S. Olivia put him in touch with Mr. Mitsuo Takada (an acquaintance of hers for many years, and the principal of the school in Japan at the time) and the rest is history. Tom has been invaluable in helping with host families, outings, etc., when Japanese students come to America. Both S. Olivia and Tom have kept in touch with Mr. Takada, who has visited in America a number of times. In October 2012, when the Sisters were the visitors to his country, he was there to greet them at Tokyo airport and kindly saw to it that they got through immigration and on the right bus to the hotel. The next morning he also made sure they were at the right terminal for the connecting flight to Muroran, Hokkaido. On their day of departure, two weeks later, he was once again at Narita airport in Tokyo to bid them farewell. He had travelled from Kyoto-- some distance from Tokyo-- for each of these meetings! I never know whether I like November or not. On the one hand, although I love winter and I'm looking forward to snow and brittle sunshine, I don't like the sense of the year fading. I don't like the damp, grey days. I don't like the hour going back and the start of long, dark evenings. On the other hand, I like the cosiness of being indoors and the thought of curling up with a good book. Thinking about how I'm looking forward to cosiness and books set me off on a train of thought that brought back lots of happy memories, like lying on the rug, by the fire, reading 'When We Were Very Young' by AA Milne, with my mother. I'd read a poem and then she'd read one and we'd keep changing off. By the way, I'll mention here, that I'm not going to launch into a tirade about why books are better than electronic means of reading. All sorts of reading is fine. It's simply that I have a lot more experience of reading printed books than anything else. So, what do I love about books and reading? I love the preliminaries: browsing in a bookstore or library, the feel and the smell of books. I love the promise of dipping into other worlds, learning something new, engaging with lives and events that I would otherwise never have access to. When I get the book home, I even enjoy the stage of osmosis, where it sits on the shelf for an indeterminate length of time and I feel that simply by having it there, some kind of knowledge is seeping into my soul. Once I begin actually reading, I love the fact that I can enter so intimately into other lives, times, ways of being. This is true of all sorts of books, whether fact or fiction. I read all sorts of books, but here's something key that underlies my love of reading, and it's the fact that reading makes me think. It keeps my mind alive. I don't read the words and believe them because they are there on the page. I mull over them, criticize them, decide if and why I agree. And it's not just about forming opinions and keeping my mind alive. It's about assimilating the world, as I learn about it, into my life of faith and prayer. Reading makes me a more rounded, whole person, more capable of bringing the needs of the world, as it is and not as I'd like it to be, into my heart and prayer. Two of our Sisters, Olivia Forster, OSB (left), and Colleen Haggerty, OSB (below right), recently visited Japan, and there’s quite a story behind their visit. Every Thursday during November, we’re going to share something of their journey with you, based on the observations and notes collected by S. Colleen and approved by S. Olivia. First of all a little background: the reason they made the visit was because S. Olivia was principal at a high school in Muroran, Hokkaido, Japan. The high school was begun by our Sisters in 1960, and has flourished for over 52 years. Following the leadership of S. Benedice Schulte, who built the new school, S. Olivia became the second principal, and remained in Japan for 20 years. The history of the school is recognized by the current leadership. 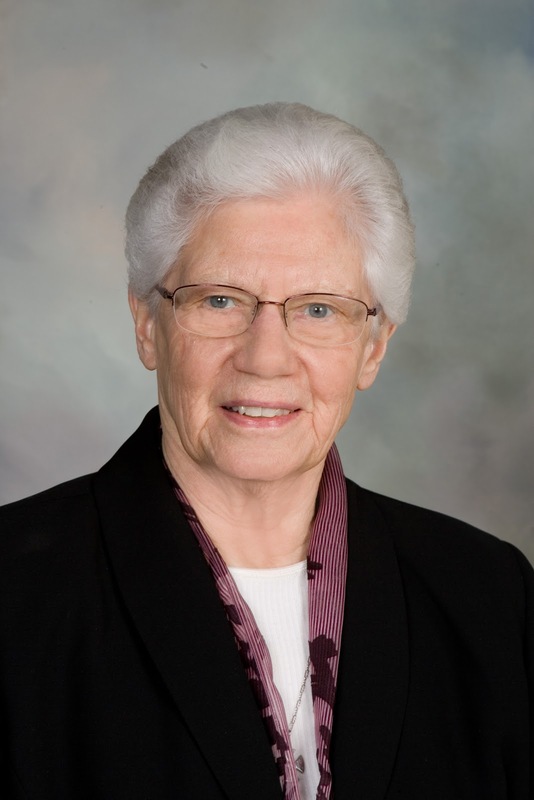 S. Colleen reports that their effort to recognize the Benedictines, and Sister Olivia in particular, was VERY evident during this two-week visit. The school, now named Kaisei Gakuin High School ("Star of the Sea" High School), is one of 11 Catholic High Schools in Japan. At its height, there were 500+ students enrolled; this year there are 175. Most of the students are not Catholic. The present principal is Kenji Kagawa, and the vice-principal/head teacher is Toshiaki Sugawara whose wife, Mineko, is a soprano opera singer. The staff includes two Catholic teachers of English: Jack Brodowski, an American who has lived in Japan for 11 years, and is married with two children, and Hiroshi Yamane who is married with two children. A third English teacher is another American, Matt Benscoter. Even though most of the students are not Catholic, these men work together very well to promote the school as a Catholic school. Next week, we’ll share how an act of great generosity enabled S. Olivia and S. Colleen to travel to Japan. Adapted from OBSERVATIONS AND NOTES collected by Sister Colleen Haggerty as she accompanied Sister Olivia Forster on a “gift” trip to Japan - October 2-16, 2012.